We all know the wisdom of monitoring familiar key performance indicators (KPIs). Turns, gross margin return on investment (GMROI), sales, inventory measures, and other metrics will tell you how your business is faring—and that’s pretty important if you want to keep your hardware store in business. However, just staying in business isn’t enough in a rapidly evolving retail world, so achieving improved KPI results is essential. 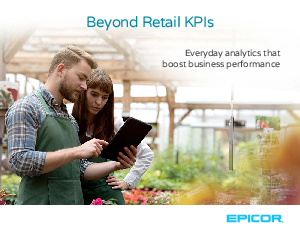 Learn more about these tools, and discover what else you can do to improve your KPI results by downloading this Epicor eBook. Download now and go beyond retail KPIs.